Regular readers will know I'm a big fan of shooting wirelessly to a laptop. My post on how to set up the Canon WFT-E4 is the most read on this site and has over 100 comments. The WFT-E4 fits the 5D mark II like a moulded battery grip providing dual controls for shooting verticals. This is an excellent design, with the only drawback being the transmitter is specific to the mark II. It simply won't fit on any other camera. 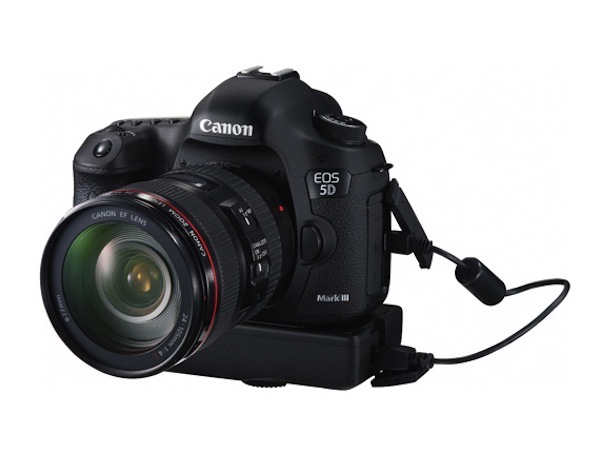 So the new 5D mark III takes a new transmitter - the WFT-E7. To their credit, Canon have tried to design the new one so that it fits all their cameras - you don't need to buy a new one every time you upgrade. Unfortunately, in the process thay have made some design decisions that make it almost useless for the way I shoot. - the transmitter has to be connected to the camera using a USB cable! Firstly, I often use the WFT on a tripod. Sure you could have the WFT attached to something else as it now has a cable, but in that case I might as well be tethered directly to the computer. Secondly, the rest of the time I use the WFT handheld. The new WFT is so unergonomic it makes the camera awkward to hold and gets in the way. It also precludes the use of a battery grip if you do want dual controls for vertical shooting - it would have to attach to the tripod thread under the grip, which is exactly where your hand would go to hold it. Finally, by connecting to the camera using a cable, it defeats the whole purpose of going wireless - avoiding having to have wires! So I sent it back within an hour of receiving it. 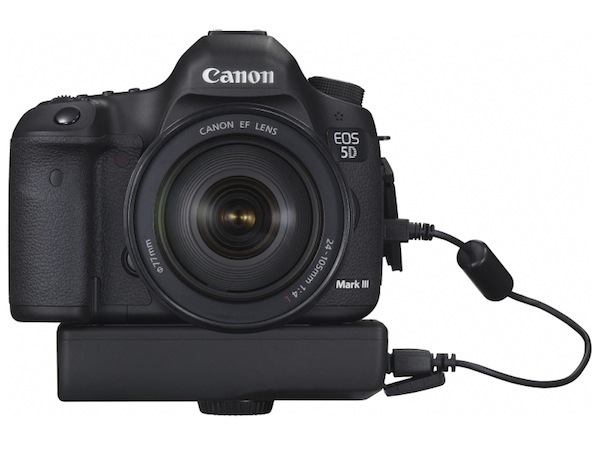 Unfortunately the 5D mark III has not been designed with the small connection port on the base that the mark II had. This means Canon will NEVER be able to release an integrated grip type transmitter like the WFT-E4. Oh well. Thankfully the mark III takes Eye-Fi wireless SD cards and they seem to work quite well. A full report on how to set them up and how well they work will come soon in a follow on post. It's disappointing for Miii users but hopefully they all find your review and others reviews outlining these issues before they buy one only having to return it as yourself had to. I have the Mii and E4, I will stick to this arrangment I think. Thanks for sharing your opinion, very helpful. Yes if you're used to shooting with the MkII and WFT-E4 then in some ways the MkIII is a step backwards... Luckily the only feature of the WFT that I use is the wireless FTP, which can now be done using an eye-fi card. If you rely on some of the other modes, such as remotely controlling the camera etc, then you're out of luck. The eye-fi card doesn't do FTP directly, it trasfer the pictures to a local PC using its software and only then you can set it to automatically upload to ftp or picasa or others..
Julian, please let me know when you're finished testing - I'm in the same boat, using the mk II and the WFT grip now with FTP only transfer. New WFT looks horrible, so I need to use Eyefi cards for a direct transfer to a portable Air computer. Hi Jullian - was about to blow $780 on the Canon wifi transmitter, before I read your blog. Now I'll go with the Eye-Fi option. Thanks a lot. Are you still using the eyefi card/ Has it improved? Do you know the range as there is nothing on their website about how far you can transmit? I am using the eye-fi cards, but only where it's not practical to tether with a cable, as they are not very reliable. Range is only about 5m and the connection drops out if you haven't taken a shot for a couple of minutes. The WFT-E7 looks like the first Canon WFT; The WFT-E1 which was also an odd shaped non-ergo brick like the E7 and used USB or Firewire to connect to the camera. Has anyone checked to see if the WFT-E7 is just an upgraded WFT-E1 or if the E1 works with newer DSLRs?? I am testing the Transcend 32GB Wi-Fi in several of my Canon cameras. First impressions are that it has more consistent connections than the Eye-Fi. They both work in my CF slot DSLRs with a CF/SD adapter. Some warn the the CF/SD adapter with the spring loaded SD slot reduces range because of a metal carrier that acts as a RF shield. The CF adapter is also available with push/pull SD slot using a plastic carrier to minimize shielding. I was thinking of getting the 5DIII and E7 but instead picked up the 6D with Wi-Fi and GPS. Very fine camera, but I would like the 5DIII capabilities. It was the E7 that pushed me away. Something like the nikon arrangement would suit me better where the transmitter is attached to the camera via a longer lead and attaches to your belt. Maybe the Canon would work with a longer cable so you can stick it in your pocket. That would be an easy fix and give you the best of both interchangeability and convenience. You will gather that I don't agree that having a cable going from the camera to the transmitter is an issue and defeats the point of wireless. The biggest pita about the last one was I couldn't get it to work with my 5Dmk2 and neither could Canon so it went back. Using a CamRanger for wireless tethering and control may be the cheaper alternative to the Canon WFT-E7. Using Eye-Fi was really slow at least in my case. I have tried using the Eye-fi with the 5D MK3 now for almost a year and have finally abandoned it . The main issues are: 1) Very slow transmission rates after the first few frames. 2) After shooting for a while you have to wait many minutes for the images to show up. 3) Sometimes nothing happens then all of the sudden a bunch of images appear (on the iPad with Shuttersnitch). 4) Sometimes images never show up at all even though Shuttersnitch is saying it's receiving a file. 5) Even rebooting the camera and iPad don't help. I kind of sated myself by saying, "Well, I don't have to see the pictures right when they are shot...I will just look over to get an idea in general how the images are looking." The problem is that wasn't good enough. In addition, my clients didn't like that. I had to say, "Well, sometimes the Eye-fi has constipation." lol! I had an exchange of emails with the Eye-fi folks explaining the problems but in the end got a "thanks but there isn't anything we can do but we have great products coming out in 2014...") I ran it through numerous tests to see if I could get better performnce including only writing small JPEGs to Eye-fi card vs. RAW+JPEG to mirror the CF card...not a significant improvement really. I was very frustrated. I agree with everything you said about the dumb design of the WFT-E7, especially after having used my 5D-MK2/WFT combination. The cord just befuddles me...who on earth was drinking what when they came up with that idea? lol! Then if I try using the battery grip the "stack" is so tall it is ungainly and you can't rest the palm of your hand under the "stack" to steady the camera and have your fingers on the lens. And, as you said, forget a tripod. Well, here is why I finally settled for the "best of the worst" options between the Eye-fi and WFT: Once set up correctly, and while writing RAW and small JPEGS to both CF and a very fast SD card, the WFT transmission rate to the iPad with Shuttersnitch was incredibly fast. Connection to the iPad did not randomly drop. And even if I turned off the camera and turned it back on, the iPad and Shuttersnitch reconnected. I now have a useable tool back in my hands with the iPad for me and my clients. No more "constipation" excuses. I only tried the CamRanger with an equipment guy at my local pro camera shop. It was pretty quick and has some great features. It is also almost a third of the price of the WFT. But it has no way to connect it to the camera (I guess I could use double stick velcro to the bottom)...but it's shape would be a problem. It uses a different battery so that's more I have to haul around. It's speed, in my very subjective observations, is not as quick as the WFT. So now what? I guess I am going to settle for the 5D MK3 body with no battery grip and the WFT-E7 screwed on under it. I am going to have to figure out a way to secure that dumb cord so I don't invariably get it tangled, jerk it out, etc. I am hoping the next Canon camera will have an integrated WFT in the body! (Doubtful...then Canon can't charge for the accessory. lol!